Nothing screams Christmas time like Christmas cookies, especially the good ol’ classics! I love mixing cookies up and having fun with them kinda like my flaxseed & pistachio shortbread cookies with a pomegranate & white chocolate glaze here or my dark chocolate, almond and orange zest shortbread cookies here but ultimately there is something about a classic, don’t mess with me Christmas cookie. So today I am sharing three of my favourites, clearly shortbread is one of them, I also love a chewy spiced gingerbread but my all time, most favourite cookie of them all is a jam thumbprint, soft, buttery, jammy and a little nutty (kinda like myself I suppose haha) mmmm mmmm! 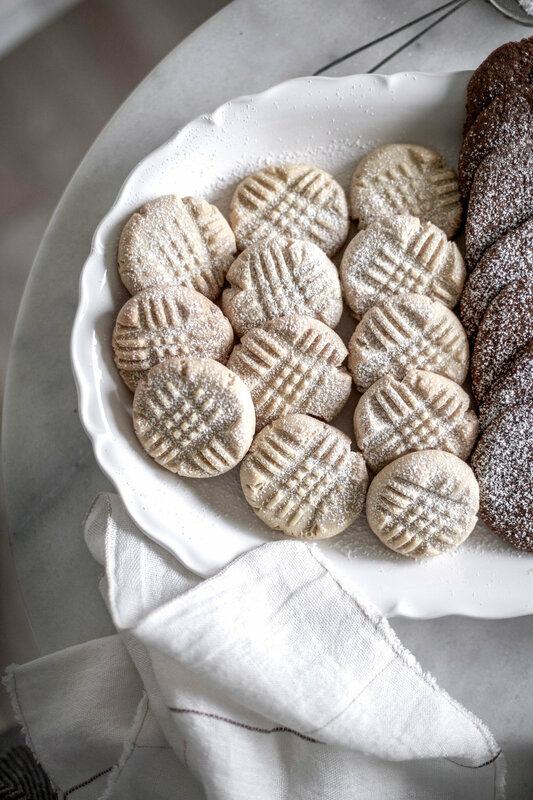 You are more than welcome to play around with the below recipes, shortbread is an awesome cookie that can take on pretty much any flavour you want to add. 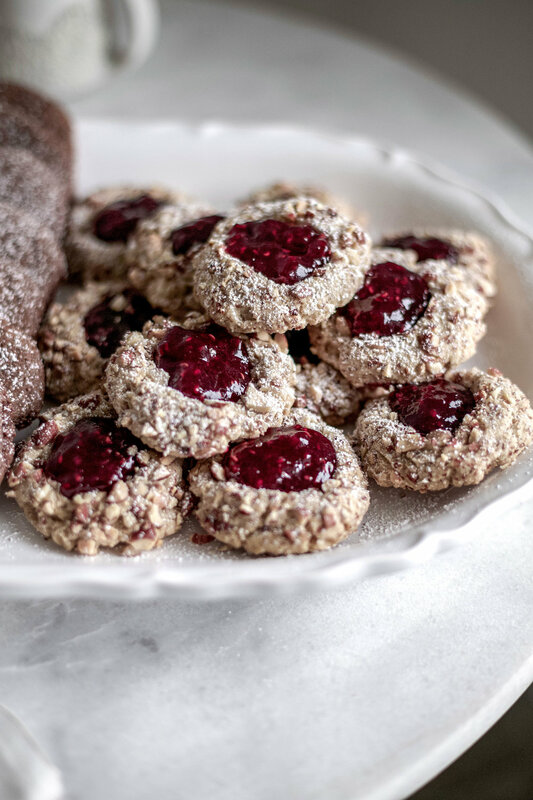 Thumbprints can be turned into all sorts of fun creations by using different jams and nuts…maybe even some Nutella?! If you want the gingerbread to be hard just leave out of the baking soda, then you can roll it out and cut it into your favourite shapes or make that other classic that comes out this time of the year, a gingerbread house! In a stand mixer, cream the butter and sugar together. Once creamed add in the egg yolks and vanilla, mixing well. Finally add in the salt and flour, mixing until combined. Roll the dough into one inch size balls and roll in finely chopped nuts of choice. Place the balls 2 inches apart on the baking sheet. Bake for 5 minutes, remove from the oven and make a thumbprint in each cookie (I literally used my thumb but you could use a spoon). Place back in the oven for another 8-10 minutes. Move to a wire rack to cool, then fill with your favourite jam. In a stand mixer cream the butter for 5-8 mins (this may seem like a long time but I feel it makes a difference in the shortbread). Once creamed add the icing sugar and mix for another 2-3 mins. Add in the vanilla, salt & flour mix until combined. Roll the dough into 1 inch round balls, place on a cookie sheet then flatten slightly with a fork. Alternatively you can put the dough in the fridge for 20 mins, then roll out with a rolling pin and cut into fun shapes! Bake for 18-20 minutes. Cool on wire rack. In a stand mixer cream the butter and sugar until light and fluffy (4-5 mins). Beat in the egg and molasses. In a medium bowl combine the flour, ginger, baking soda, cinnamon, cloves and salt; gradually add the flour mixture to the creamed butter and sugar. Roll into 1 inch balls, then roll in sugar (this is an optional step, personally I like them without the extra sugar). Place the cookies about 2 inches apart on the baking sheet. Bake until puffy and lightly browned, 10-12 minutes. Move to wire rack to cool. Copyright © 2018 Lyndsey Eden. All Rights Reserved.